Around a fortnight after the Reserve Bank of India (RBI) announced a distinctly hawkish inflation guidance in its annual monetary policy on 3 May, yields on 10-year government bonds or those of lesser duration tumbled below the central bank’s policy rate of 7.25. A 10-20 basis points (bps) decline in bond yields would not have been unusual since the market has been expecting another rate cut; it is the degree of correction, especially at the longer-end, that has surprised some. That the primary auction yield on 10-year paper sold on 17 May fell below the policy rate floor when market liquidity remains tight and the central bank’s hawkish stance remains (as yet) unchanged begs explanation. The RBI monetary policy statement indicated that the Indian central bank expected wholesale price inflation to be range-bound around 5.5% during 2013-14. The provisional April wholesale price inflation, released 11 days after the review, was 4.9%. This could well be revised upwards, as it was in February and March, closer to 5.5% and within the central bank’s guidance range. Hence, the April inflation number should not have surprised the market. But markets have welcomed it with zeal, even forcing governor D. Subbarao to admit that the new number could be a significant factor for consideration in its mid-June policy review. His statement fuelled speculation of an imminent policy rate cut, in contrast with the earlier hawkishness. Bond yields tumbled. In the secondary market, yields declined between 30-50 bps, with the benchmark 8.15% 2022 yield closing at 7.40% on Friday, from 7.74% a fortnight ago. 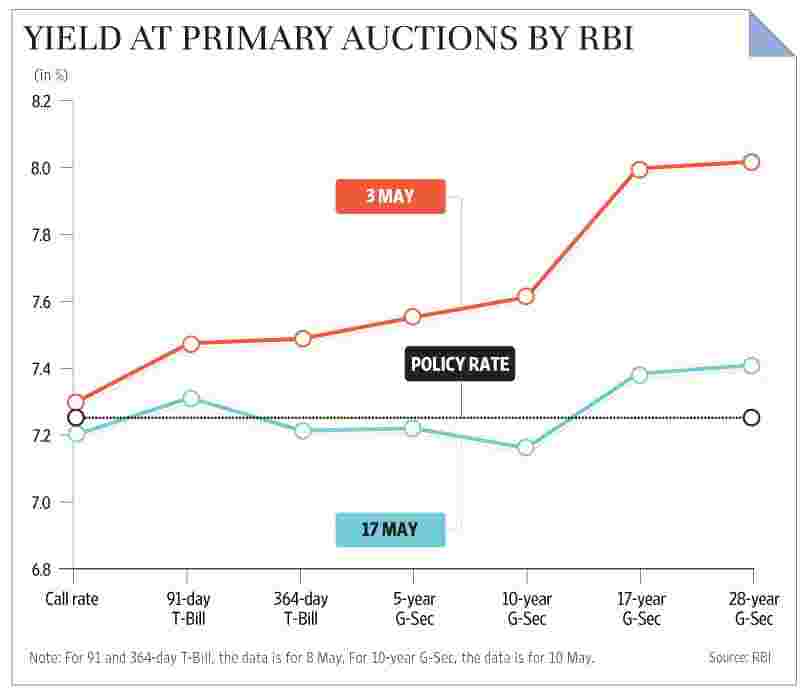 The primary auction held by RBI on 17 May saw a much sharper correction, with yields at the longer-end of the curve falling as much as 60 bps from levels on 3 May. A look at the flatter yield curve would suggest so. Perhaps the market is not accepting RBI’s inflation projections anymore; it thinks that inflation at around a 5.5% range will not be the case in 2013-14; and that inflation softening a bit in the first-half with a second-half reversal might not hold. Perhaps the market belief is more firm that wholesale price inflation will continue trending south during the whole year and its long-term outlook for inflation has turned more benign than what RBI would like it to believe. That April consumer price inflation also fell significantly further strengthens the case in support of a rate cut. It is hard to say whether this belief is widespread across participants, but the aggressive manner in which yields have been hammered down in one week leads one to infer that a prominent market segment believes that March 2014 inflation could very well turn out to be much lower than the 5% target anchored by RBI. The message from the bond market seems clear: RBI needs to change its hawkish position and the current policy rate is too high relative to inflation. While there appeared a near-consensus among analysts about a 25 bps reduction by RBI in its mid-June review—though some think this may happen in July—the market, by pushing the yields below the policy rate, is saying a 25 bps cut may be inadequate; it would welcome a deeper cut, sooner than later. Does this imply it is the market, not the central bank, which leads in anchoring inflation? Can one trust the market’s assessment of inflation over the central bank? More importantly, will RBI heed the market and prepare for a deeper rate cut? Or, will it stick to its own guidance and force the market to retreat? Against its annual policy guidance of “lack of space for further easing", RBI would want to avoid getting dragged in by the market as it remains wary of loosening monetary conditions too much and too soon as this could stoke inflation back; instead, it would rather live with a flatter yield curve for some more time. But will RBI be able to regain control and lead the market? This, much to its discomfort, will depend on inflation data for May, releasing a couple of days before the 17 June review. Should these figures be aligned to market expectations, RBI will unfortunately be left with no option but to fall in line. For a central bank, such a situation would be embarrassing as questions like “who is anchoring whom" will surface, while its credibility to be able to guide the market would have taken quite a beating! Whatever be the actual trajectory for wholesale price inflation ahead, the fact that the market and the central bank have significantly different views cannot be a comfortable situation for the central bank. That circumstances have come to such a pass owes much to RBI’s own failure to anchor inflation and inflationary expectations in the recent past. It goes without saying that if RBI were to restore its credibility in anchoring inflation, it must get its inflation projection closer to the actual. Renu Kohli is a New Delhi-based macroeconomist; she is currently Lead Economist, DEA-ICRIER G20 Research Programme and a former staff member of the International Monetary Fund and the Reserve Bank of India.